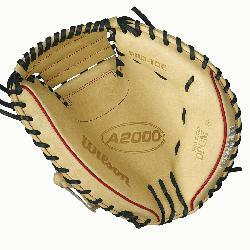 A2000 CM33 33 inch Wilson A2000 CM33 Catchers Mitt. The all new 33 A2000 CM33 has a deeper pocket and catching area for better control and the pattern was designed for better scooping of balls in the dirt. 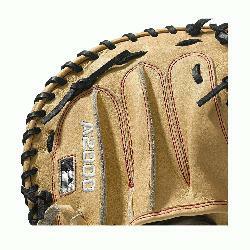 The heel pad is thinner than traditional catcher's mitts so that the glove is lighter and will break in quick. This also encourages a quicker transfer from mitt to throwing hand. Runners will quickly learn to not test you. Constantly improving patterns. Materials that perform. Meticulous dependable construction. The evolution of the A2000 baseball glove has been driven by insights from the Wilson Advisory Staff. This is why hard working players love its unmatched feel, rugged durability and perfect break-in.33 Catcher's ModelHalf Moon WebExtended PalmMLB Most Popular Catcher's Mitt PatternPro Stock Leather for a long lasting glove and a great break-inDriLex Wrist Lining to keep your hand cool and dryCatcherRHT 33 Pro Stock Leather. 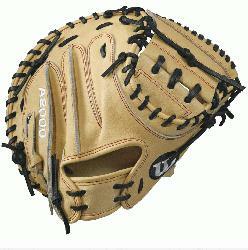 The most famous baseball glove, the Wilson A2000, just keeps getting better. The Wilson glove team is constantly refining the A2000 Pro Stock patterns with the insights of hundreds of MLB players every season, and applying those alongside the innovative technology that has made the glove so popular among ballplayers at all levels. Made with Pro Stock leather -- identified specifically for ball gloves long before it reaches your hand and expertly-chosen -- the A2000 is built to break in perfectly and last for multiple seasons. But even long after break-in, technological components such as Dual Welting maintain a durable pocket and long-lasting form. Some Wilson A2000s are made with SuperSkin, a proprietary material that increases durability and lightens the weight of the glove.